Hasbro is kind to send us their official Product Description press release for Transformers: Robots In Disguise toyline for the year 2017. TRANSFORMERS: ROBOTS IN DISGUISE, returning for its third season in Spring 2017, will be COMBINER FORCE themed, with the AUTOBOTS and DECEPTICONS taking the battle between good and evil to new heights with the introduction of COMBINERS – teams of Transformers who combine forces to create larger, more powerful bots. BUMBLEBEE and the AUTOBOT team must learn how to fight the DECEPTICONS when combined with one another and truly work as one! New for Spring 2017, favorite Transformers are truly ‘more than meets the eye’ with the addition of new CRASH COMBINER and ACTIVATOR COMBINER figures. Slam together the CRASH COMBINER figures to form a new bot and partner up ACTIVATOR COMBINER figures to create a bot and imagine new, enhanced abilities. Then in Fall 2017, can create bigger, more powerful characters with the TEAM COMBINER figures. Download the TRANSFORMERS: ROBOTS IN DISGUISE mobile game and scan each figure into the app. Each figure is imprinted with a scannable shield that when scanned into the app unlocks that character for battle action! Check out the complete Press Release, after the jump. You can also check out all the official images right here and check out our Toy Fair 2017 showroom pics right here. Hasbro’s TRANSFORMERS: ROBOTS IN DISGUISE line features fun play patterns and a fresh new style, based on the hit animated series TRANSFORMERS: ROBOTS IN DISGUISE. What happens when kids crash and combine forces with 2 characters in the TRANSFORMERS: ROBOTS IN DISGUISE animated series? They get a 2-bot CRASH COMBINER figure! Kids can combine forces with each new CRASH COMBINER figure in one easy step to get right into the action and imagine powering up for battle. Crash these figures with other CRASH COMBINER figures to form different 2-bot combinations (additional figures are each sold separately). 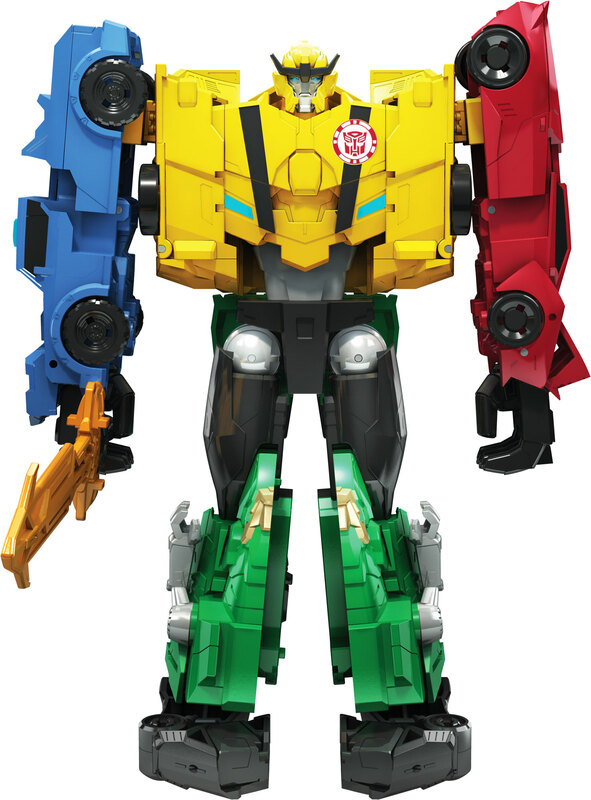 Kids can choose to crash and combine forces with BUMBLEBEE and SIDESWIPE to create BEESIDE or OPTIMUS PRIME and STRONGARM to create PRIMESTRONG. Download the TRANSFORMERS: ROBOTS IN DISGUISE app to your digital device, then scan the shields on the figure to unlock a character! Available at most major retailers and on HasbroToyShop.com. Kids can power up their favorite bots with the new ACTIVATOR COMBINER figures, based on the hit TRANSFORMERS: ROBOTS IN DISGUISE animated series! By combining the ACTIVATOR COMBINER figures, fans can activate awesome popout battle modes, including combining BUMBLEBEE and STUNTWING to activate flight mode or STRONGARM and TRICKOUT to activate a super power boost. Activate these figures with other ACTIVATOR COMBINER figures (additional figures are each sold separately). Download the TRANSFORMERS: ROBOTS IN DISGUISE app to your digital device, then scan the shields on the figure to unlock a character! Available at most major retailers and on HasbroToyShop.com. In the TRANSFORMERS: ROBOTS IN DISGUISE Combiner Force animated series, Bumblebee and his heroic team of AUTOBOTS must unlock the secrets of combination to combat DECEPTICONS that are bigger and badder than they have faced before. Fans can now join the action by combining forces with TRANSFORMERS: ROBOTS IN DISGUISE COMBINER FORCE LEGION CLASS FIGURES, smaller-scale figures that feature classic TRANSFORMERS conversion. Each 3-inch figure converts from robot to alternate mode and back in less than 10 steps. With a variety of characters to choose from, fans can bring home and collect some of their favorite characters from the TRANSFORMERS: ROBOTS IN DISGUISE animated series. Download the TRANSFORMERS: ROBOTS IN DISGUISE app to your digital device, then scan the shields on the figure to unlock a token! Available at most major retailers and on HasbroToyShop.com. In the TRANSFORMERS: ROBOTS IN DISGUISE Combiner Force animated series, Bumblebee and his heroic team of AUTOBOTS must unlock the secrets of combination to become more powerful robots combat DECEPTICONS that are bigger and badder than they have faced before. Join Bumblebee and his team to help them chase down DECEPTICONS with these figures that change between modes in 1 quick step! TRANSFORMERS: ROBOTS IN DISGUISE COMBINER FORCE 1-STEP CHANGERS let fans experience the “Wow!” of simple conversion with some of kids favorite TRANSFORMERS characters. Each figure converts from robot to alternate mode in 1 quick step. Download the TRANSFORMERS: ROBOTS IN DISGUISE app to your digital device, then scan the shields on the figure to unlock a token! Available at most major retailers and on HasbroToyShop.com. In the TRANSFORMERS: ROBOTS IN DISGUISE Combiner Force animated series, Bumblebee and his heroic team of AUTOBOTS must unlock the secrets of combination to become more powerful robots and battle DECEPTICONS that are bigger and badder than they have faced before. Join Bumblebee and his team and help them chase down DECEPTICONS with these figures that change between modes in 3 smooth steps! TRANSFORMERS: ROBOTS IN DISGUISE COMBINER FORCE 3-STEP CHANGERS let kids experience some of their favorite Transformers character’s conversion. Download the TRANSFORMERS: ROBOTS IN DISGUISE app to your digital device, then scan the shields on the figure to unlock a token! Available at most major retailers and on HasbroToyShop.com. In the TRANSFORMERS: ROBOTS IN DISGUISE Combiner Force animated series, Bumblebee and his heroic team of AUTOBOTS must unlock the secrets of combination to become more powerful robots and battle DECEPTICONS that are bigger and badder than they have faced before. These TRANSFORMERS: ROBOTS IN DISGUISE COMBINER FORCE WARRIORS Class figures allow fans to join Bumblebee and his team and help them chase down DECEPTICONS! WARRIORS Class figures are larger-scale figures that feature classic Transformers conversion and awesome weapon accessories. Each figure converts between robot and alternate mode and back in fewer than 10 steps. Download the TRANSFORMERS: ROBOTS IN DISGUISE app to your digital device, then scan the shields on the figure to unlock a token! Available at most major retailers and on HasbroToyShop.com. Unleash the power of an entire team of Transformers figures at once when kids combine them together to build one giant robot figure! Based on the hit TRANSFORMERS: ROBOTS IN DISGUISE animated series, TEAM COMBINER packs let kids combine multiple figures together to create an even more invincible, super-robot figure! Choose to combine Bumblebee’s core AUTOBOT team to form ULTRA BEE TEAM COMBINER or combine DECEPTICON figures to form MENASOR TEAM COMBINER or GALVATRONUS TEAM COMBINER. The universal joint system means each figure works with other TEAM COMBINER figures or CRASH COMBINER figures, so kids can build their own Combiner robot! Download the TRANSFORMERS: ROBOTS IN DISGUISE app to your digital device, then scan the shields on the figure to unlock a character! Available at most major retailers and on HasbroToyShop.com.